Facial Rollers are a beautifully crafted tool with endless benefits! 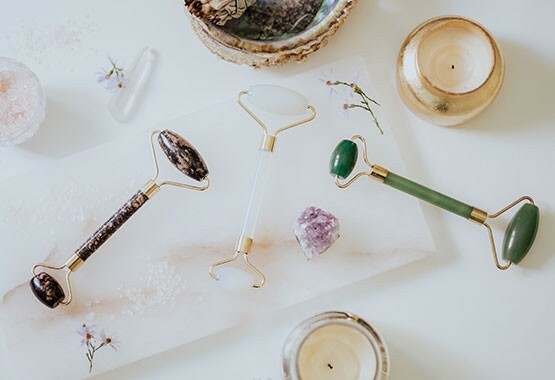 Each roller features two different polished stones, one for your cheekbones and forehead, the other for delicate areas like around the eye and nose. The rollers are cut from natural gem stones. My official fall self-pamper kit. When autumn comes around and evenings start to get a little cooler, I tend to fall in love with the feeling you get when you lie down in a fresh-out-of-the-dryer set of bed sheets. This roller (fresh-out-of-the-fridge however) gives the exact same feeling to my face. The pressure from rolling drains congested lymph nodes and increases lymphatic flow for a natural glow. Our rollers help to decrease inflammation and fine lines. The pressure helps to tighten and reduce pore size. Reduces dark under eye circles and eye bags with regular use. Use the smaller sized stone for this delicate area. Pair it with the rosehip oil to allow for deeper penetration into the skin, enhancing the benefits of the oil. This is a great accessory, good quality and work wonders. I use at night to push my night cream in and once I’m the morning after waking up get rid of your face and eye puffiness. Our rollers come in different natural gemstones. Our customers use their Face Rollers with our Organic Rosehip Seed Oil. Rosehip Seed Oil is pressed seed oil extracted from a rose plant. The oil is rich in vitamins, antioxidants and essential fatty acids and is used to brighten dark spots, hydrate skin and protects against scars and fine lines.